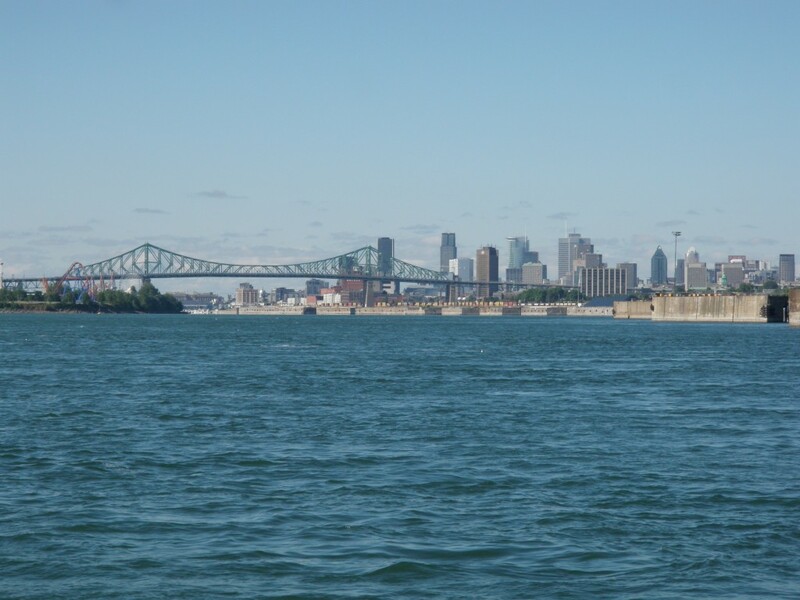 Our travels since our last post have brought us back up the St. Lawrence River as far as Montreal. We plan to spend at least a week here because it’s one of our favourite cities, with many things to do. Stops along the way from Tadoussac included Saint-Jean-Port-Joli, a small town on the south shore about 50 miles downriver from Quebec City, Levis (right across the river from Quebec City), Trois Rivieres again, and a surprisingly quiet anchorage on the Saint Lawrence only 5 miles from downtown Montreal. Although we have driven through a good portion of the area before, completing our ‘St. Lawrence Loop’ – about 625 miles – provided us with a much richer image of the river and the region. The ‘on-the-water’ experience added a new perspective that one does not get from land. 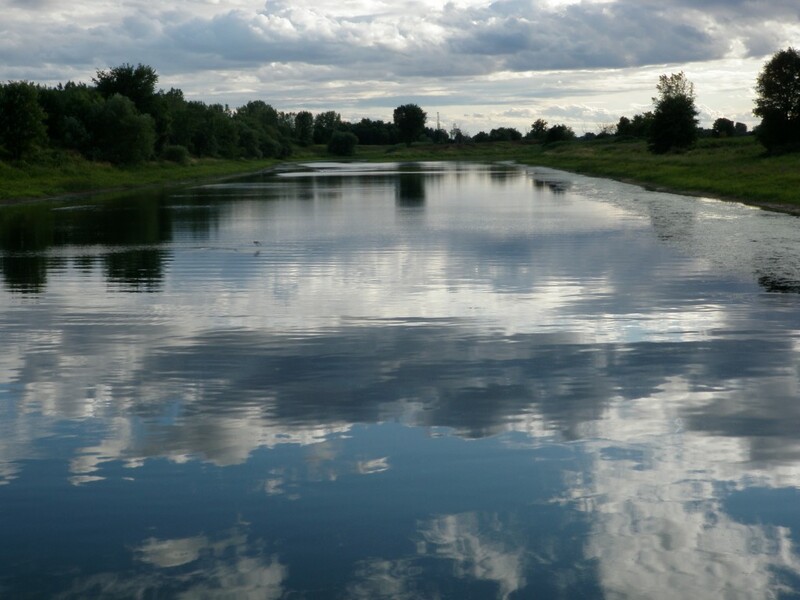 It also gave us a better understanding of the river’s significant influence on our country. Upon reflection, gaining new perspectives that add to or change our pre-conceived notions is true for all for our travels aboard His Idea. It’s one of the rewards of cruising that we have come to highly value and enjoy. 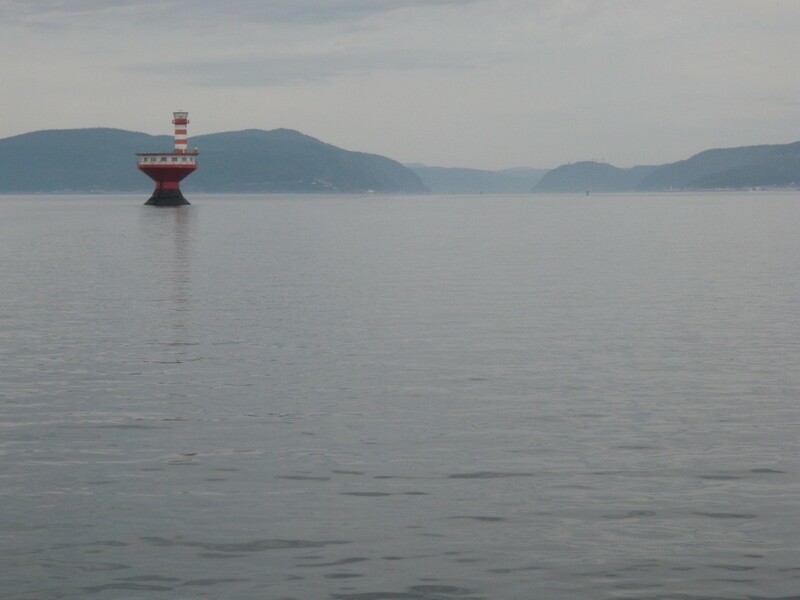 A view of the distinctive Prince Shoals lighthouse, about 5 miles off Tadoussac; many beluga whales were again evident during this early morning departure. 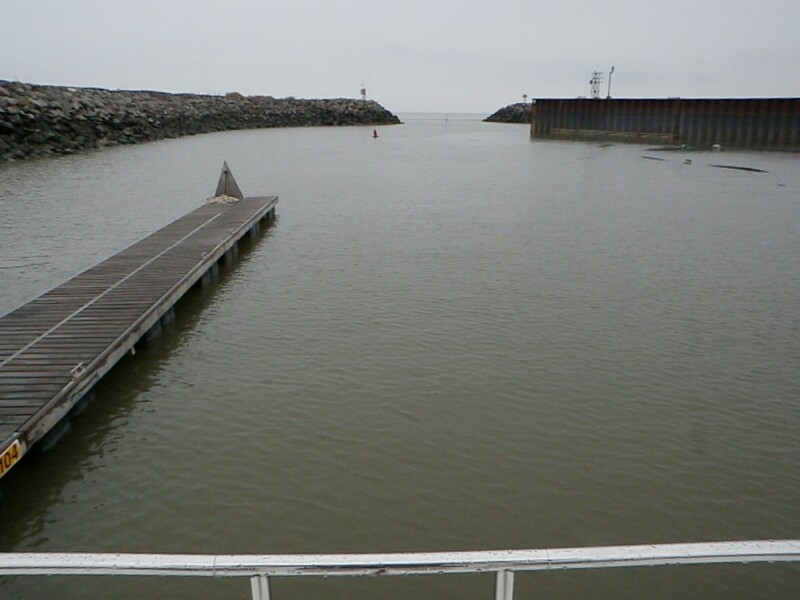 The Saint-Jean-Port-Joli harbour entrance, shortly after our arrival near high tide…..
…..and the harbour basin at low tide; the wide tidal range here and very shallow shores require entrance to the basin at least one hour before or after low tide. 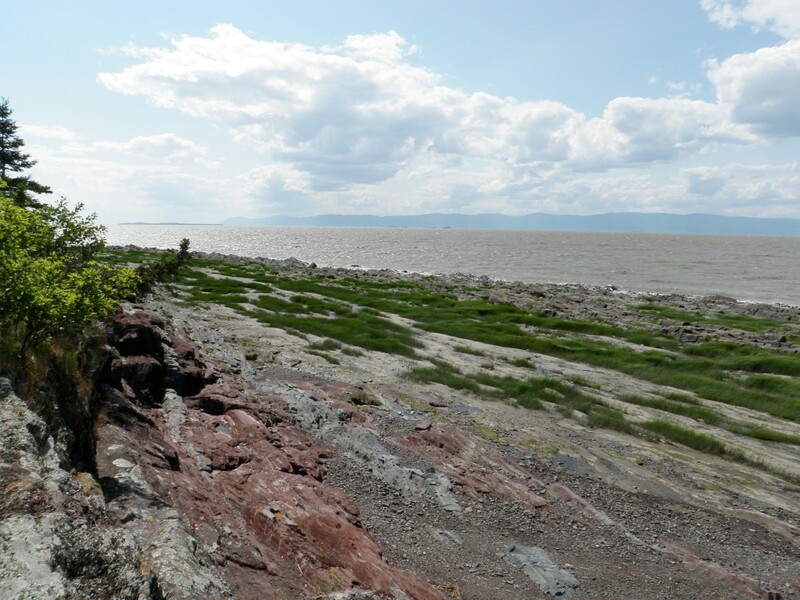 A view of the south shore of the St. Lawrence, looking west towards the small islands of l`Ile aux Oies. 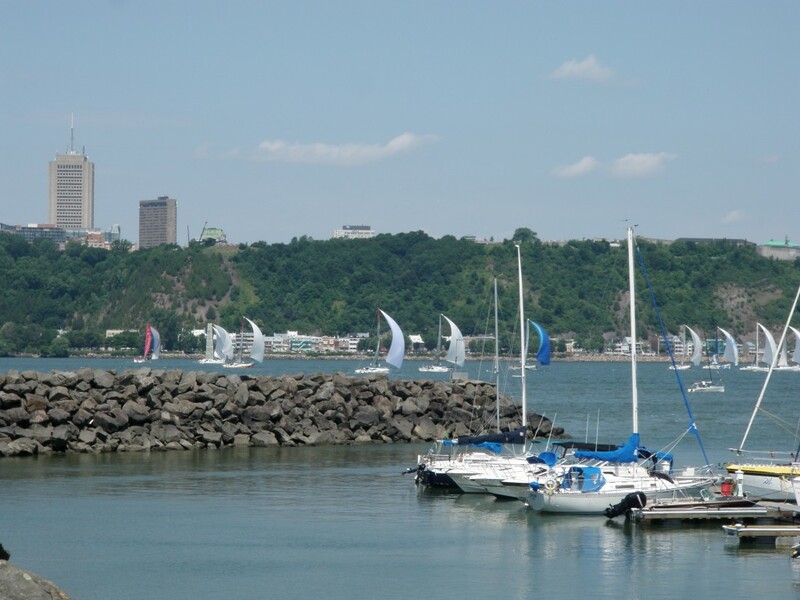 A view from our marina in Levis of the start of the Quebec City to St. Malo, France, sailboat race; we counted about 25 boats, including three very large trimarans. 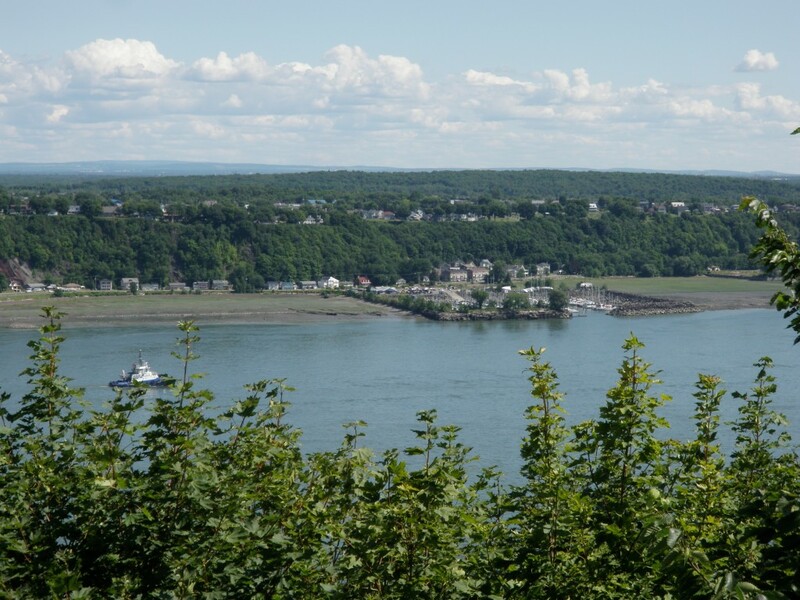 A view of Levis from the heights of the Plains of Abraham; we took a guided tour of the inside of the Citadel for the first time, and found it very interesting…..
…..including Batisse, the regimental mascot for the Van Doos regiment stationed there (the Citadelle remains an active military post to this day). 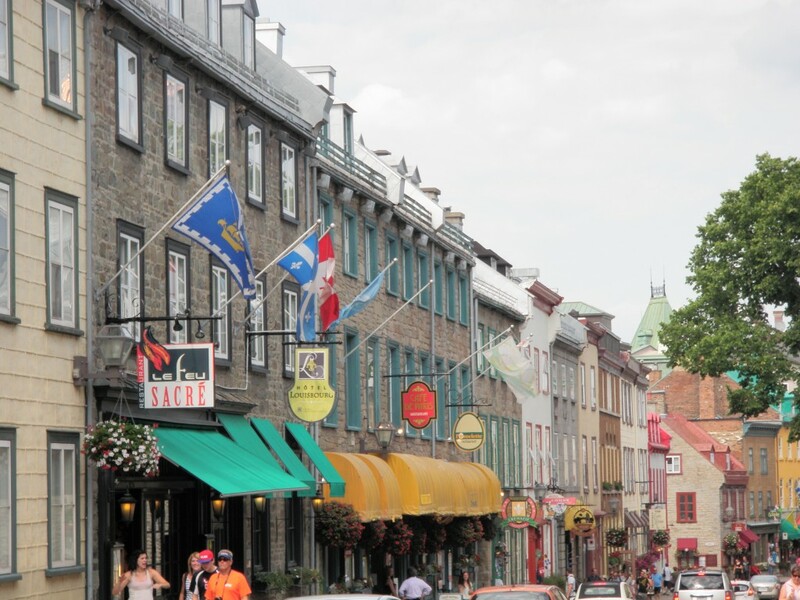 A street scene from Old Quebec, a UNESCO World Heritage site; it celebrated it`s 400th anniversary in 2008. 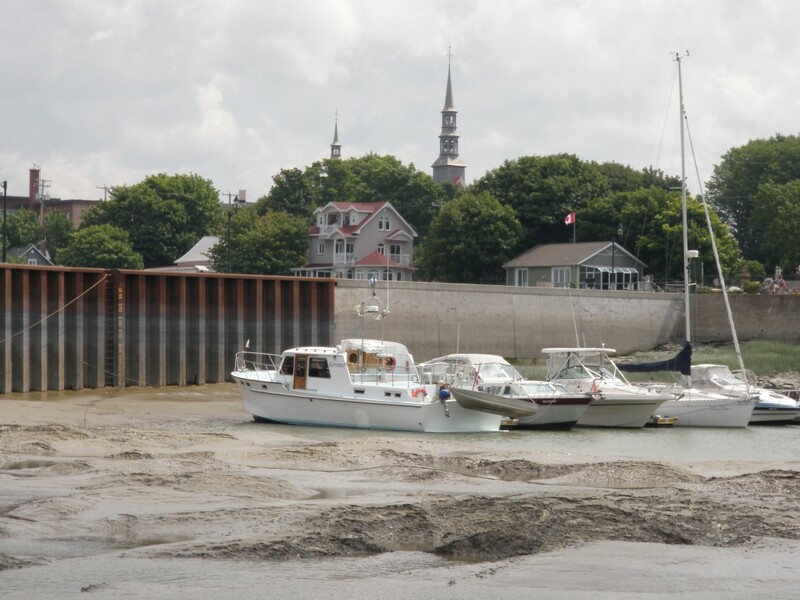 A scene from our quiet anchorage between two islands just a few miles from downtown Montreal. The approach to Montreal from downstream, with the Jacques Cartier Bridge in the foreground. 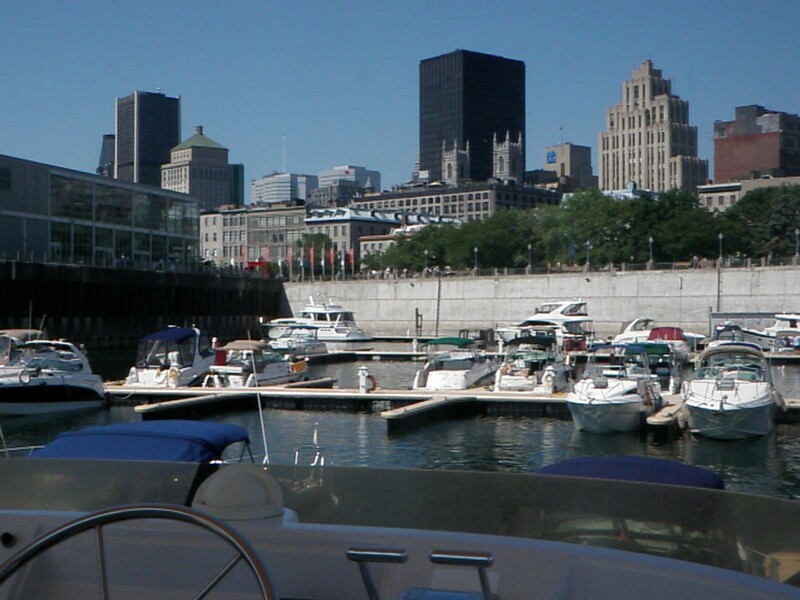 Right in the centre of the action at the Old Port – the view from our berth at the Port d’escale of the Quays (one of the newest and best marinas we have seen so far). 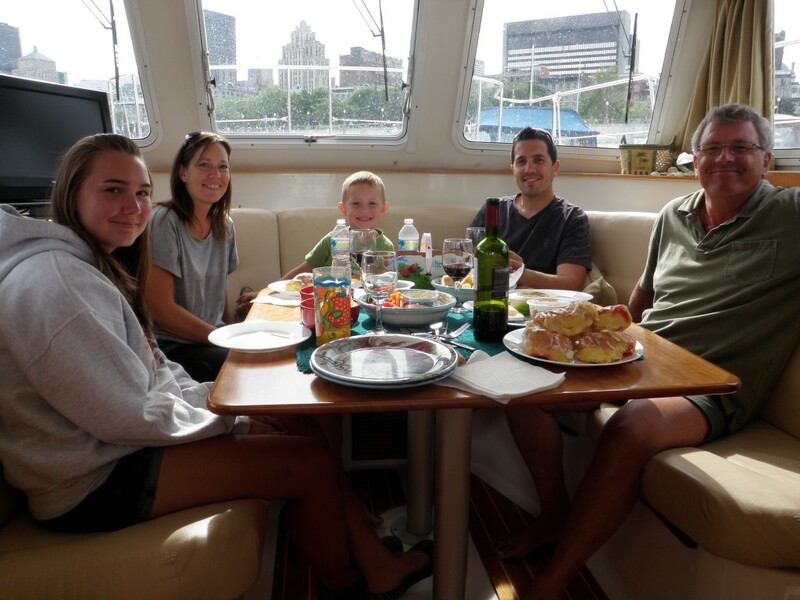 Hosting the Doyon family – Mattea, Mindy, Makinley and Patrick – while visiting Montreal. 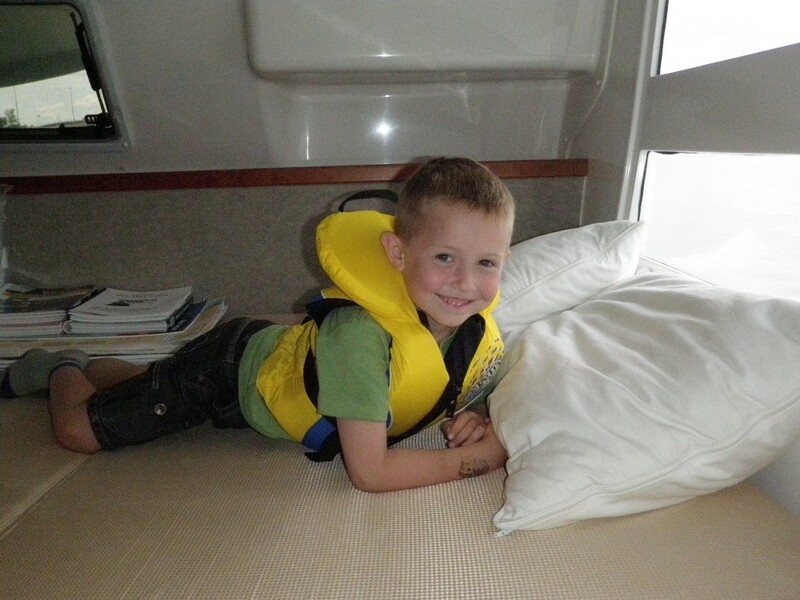 Makinley quickly claimed the guest stateroom as his `man cave`. 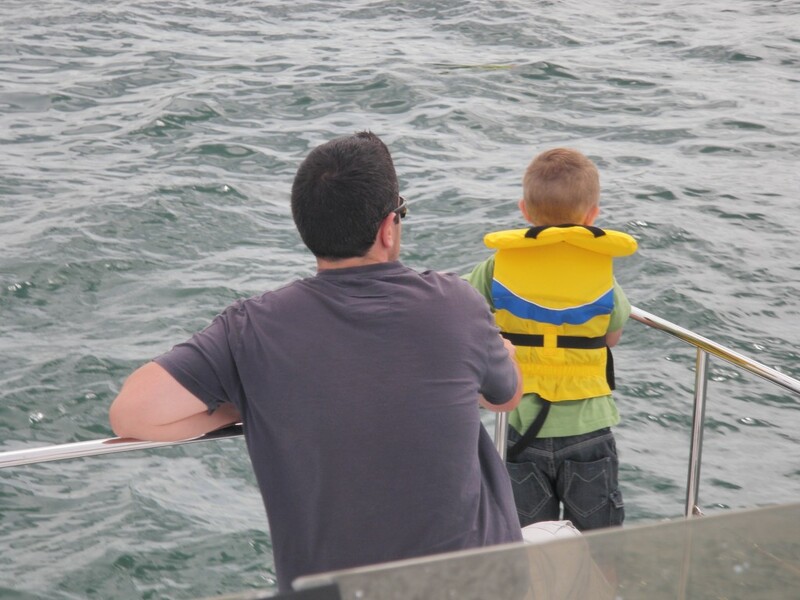 Patrick and Makinley enjoy the rush of cruising from the bowsprit (a la Titanic). 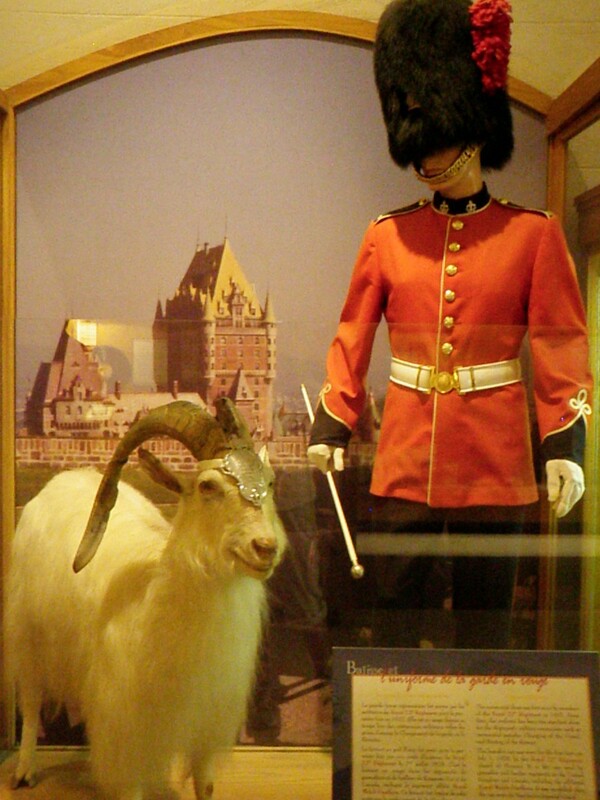 More to come from Montreal in our next post…. It’s good to hear from you and that you have caught up with us through the blog. We are indeed enjoying a more active and healthy lifestyle, and feeling better for it. Hope you’re enjoying the summer, either in Vancouver or down south. We’ll look forward to catching up with you when we get back, which will likely be by the end of September. just caught up after not being online for awhile… busy camping in our ‘new’ trailer! Looks like you’re still having a great time! Happy travels! Thanks Doug, we are for sure having a good time. Hope you and Roslyn are enjoying your vacation time too. Send us some pictures when you get a chance. I just discovered I sent the previous response to your brother by mistake. Mush is what happens to one’s brain when you’ve been away too long! Please send some pictures of your trip (to jaevans100@gmail.com) if you get a chance. It would be fun to see them.